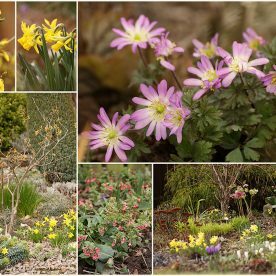 Are you wondering what’s in bloom in February in this Perthshire winter garden? I always look forward to February as it’s the month of anticipation in the gardening calendar. Buds are appearing on the bare branches while tiny shoots are breaking through the soil that is when they don’t have a layer of snow on top. It’s exciting watching the garden come to life again! I’m pretty sure that down below the first few inches of soil and snow there’s lots of activity going on but above ground very little seems to have changed since I wrote What’s in bloom in January. …………………Maybe I’m being just a little bit impatient! The winter of 2011/12 was an exceptionally mild winter while the winter of 2012/13 has been more ‘the colder norm’. Flowers like the crocus that featured in this post about February flowers are going to bloom much later this year. Here’s what’s in bloom in February in my garden. All of the photographs with the exception of 1 were taken on 14th February at various times of the day while the snow slowly melted. 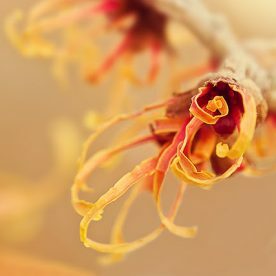 Many of you who visit here will already know that the witch hazels are in full flower as I’ve shared quite a few blog posts recently on the subject. Do you desire an irresistible winter garden? and Want to go on a Witch Hunt? They are magnificent shrubs for giving winter interest and colour throughout the gloomiest of days. The perennial wallflowers Erysimum ‘Bowles Mauve’ haven’t stopped flowering since I bought them back in the summer time. I’ve had these plants growing in my garden for years but they are short lived and every few years I need to replace a few. This plant has flowered throughout the winter and is sending out fresh budded growth. The snowdrops just need a little more heat and sunshine before they open their buds. There’s always a pulmonaria in bloom at this time of year. This one started to bloom back in December. While a few of the cyclamen flowers managed to poke above the snow. The pink winter flowering Erica carnea heathers are starting to bloom though I took this photograph last Sunday, 9th February before the snow arrived. Scotland and heathers are synonymous as our climate and soil suit them so well. They are best planted in a southerly position as their foliage colours up so much better from that side. If you’ve never seen the photos of the wild Scottish heather in the Cairngorm mountains then check out The Carpet of the Highlands post. It won’t be long before more of the primroses are in flower and the Daphne has lots of dark purple buds ready to open. But winter interest doesn’t always have to be just about flowers! 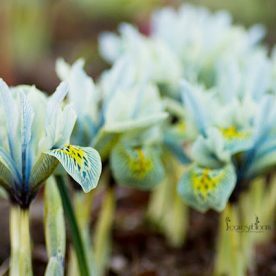 Don’t miss my next blog post as I’ll be sharing the plants that give late winter interest in my Perthshire garden. 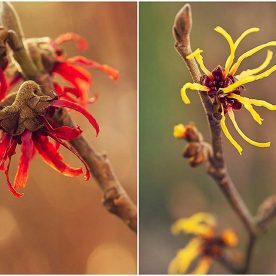 What’s in bloom in your February garden today? I cannot stop admiring your garden flowers. Amazes me when I still see snow still holding on the branches while the plant still blooming. Thanks guys 🙂 my only fear is that the weeds that I let seed by accident probably are in more of a fighting mood than the flowers. I know Jim that must be quite unusual for you to see considering your tropical climate. Thank you. Thank you Helene – you're normally weeks ahead of me in the gardening season. Thanks Valerie – I'm sure you can't wait for that snow to melt. I think I would miss having February blooms in the garden if it was covered in snow most of the time. I am always amazed to see Cyclamen in the snow! Hello Rosie, even if you don't seem to have so few colors and blooms in your area, you always make your photos elegant and wonderfully complete on their own. Did you edit them your usual way? It is amazing that activity seems to be so slow there, which is the total opposite here. Sometimes, i wish some of our blooms stay longer in showing their beauties, but our heat always terminate them sooner! The cyclamen are always remarkable little February blooms. Thank you Lea. Thank you Andrea – I only shoot in raw so have to turn them into jpgs in adobe camera raw. The one with the heather is a bit arty though I leave the very arty ones for FB and G+ rather than here. This is the first time I've visited your blog. What super photos. I don't envy you the snow, but you've got more out in your garden than I have at the moment, down here in Surrey, where everything is wringing wet. It hasn't put me off gardening today though by this stage it just looks messy and not very picturesque. Thank you very much for visiting today and I'd never been over to your site either until today too. You've had a very soggy winter down in England this year. Thank you Anna – maybe in March our gardens will have an explosion of colour. I can remember that last March we had a heat wave……..alas that didn't last long! Your February garden is just beautiful. Love those hellebores and the witch hazel blossoms do indeed remind me of my loropetalum. Oh Rosie-your blooms and photographs are so beautiful! The first photo of the Helleborus orientalis 'Picotee' is breathtaking. Thank you for stopping by to see my garden as well! Happy GBBD! Such beautiful hellebores. I am going to have to save up some dosh to spurge on some for next year. Witch Hazel just fascinates me, having never seen anything like it at all here. I particularly love your Orange Beauty. Your Hellebores are simply lovely, and so is your Erica. It's great to see the signs of Spring popping up. Ha ha as you know nothing is growing in my garden. We have wild Heathers that grow up in the mountains Cassiope spp and Phyllodoce pp. Their leaves are similar to the one in your photo. Rosie, so little blooming here in Aberdeen, but like you I am always pleased to see February as it does seem to herald the beginning. Your Hellebores look amazing whilst ours are still in bud and Pulmonaria already. I planted some pulmonaria Blue Ensign last Winter and they flowered very nicely in early Spring. Today I was checking on them expecting to see some sign of leaves, but nothing as yet, I will be so annoyed if they don't show up.. Your photos are gorgeous, as your garden must be. Happy Garden Bloom Day! @Dorothy Borders Thank you very much – we certainly have very different plants in bloom in February. @Janet/Plantaliscious Thank you Janet I'm sure you're list is getting longer and longer. @Bernie H Thank you Bernie – glad you enjoyed seeing the February blooms from my garden. @Melanie J Watts Thanks Melanie – we have those heathers in the highlands aswell. @Alistair Hi Alistair I haven't seen my Blue ensign yet either but I'm sure it will appear. @Landscape Design By Lee Thank you Lee. I can always depend on that little hellebore to be in bloom every February. @Jean The garden is quite bare at the moment but it's lovely seeing it all emerge again after the winter. I am catching up with all the bloom postings. Beautiful flowers. I love the colour of that little pulmonaria. Your photography skills are amazing. 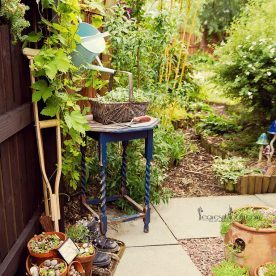 Thoroughly enjoyed looking at your garden. The quality of your photographs quite take my breath away! 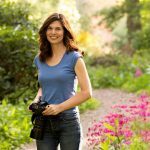 Aren't blogs wonderful to provide so much for free? It's only in the last year I have discovered the pleasures of blogging! Don't forget Viburnum Pink Dawn. 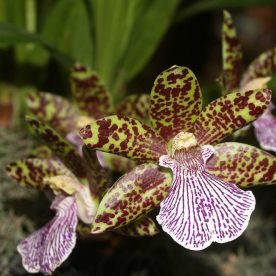 I saw one at the garden center blooming in December, and planted four of them. From what I have read they bloom for several more months, including February.